For reasons unrelated to baseball, this wasn’t a very good weekend for me or my family. The good news is that Opening Day is less than two weeks away, and on April 1st, anything can happen. On Friday, I got a bunch of baseball cards in the mail from someone who stumbled across my blog. 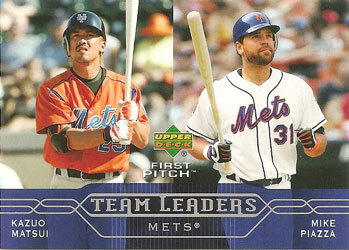 Among them was this 2005 Upper Deck First Pitch card recognizing the Mets’ team leaders in 2004. Matsui earned one voting point for the award in 2004, which was won by a Pittsburgh Pirates outfielder named Jason Bay. 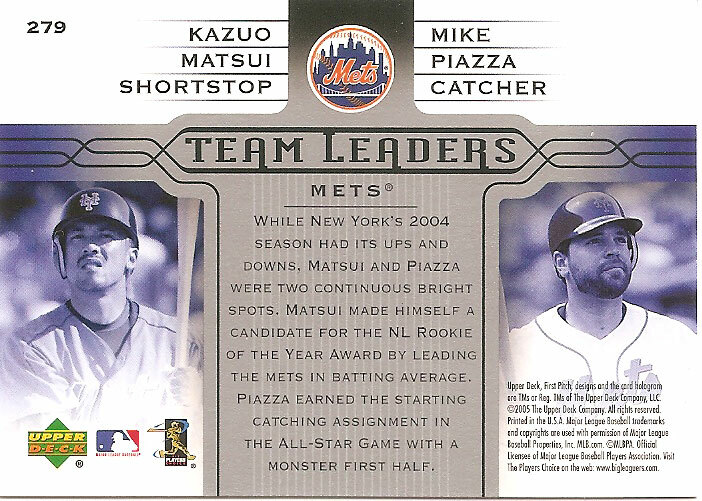 But Matsui really did have the highest batting average of all the Mets players who spend the full season with the team – something that wouldn’t be immediately obvious to you if you just saw the .272 figure on the back of a baseball card. In most respects, Matsui was a colossal disappointment in New York – remember, the Mets thought highly enough of him that they moved Jose Reyes to second base in 2004 so Matsui could play shortstop. But on Opening Day? Matsui had the magic. In 2004, he hit a home run to lead off the game in his first major league at-bat. He added a pair of doubles and two more RBI in the Mets’ 7-2 victory over the Atlanta Braves. In 2005, Matsui again homered in his first at-bat of the year. This time, the Mets to the Cincinnati Reds 7-6 when Braden Looper gave up back-to-back 9th inning home runs to Adam Dunn and Joe Randa. In 2006, Matsui’s final year with the Mets, he missed Opening Day because of a sprained medial collateral ligament. However, on April 20, he hit an inside-the-park home run off of Jake Peavey in his first at bat of the season as the Mets defeated the San Diego Padres 7-2. Let’s hope that the 2013 New York Mets have some pleasant surprises in store for us… I sure could use some. My assumptions for this season have long been that the Mets will do the mirror image of last season. Which is to say they’ll start poorly and finish strong–still ending up in last or next to. Just a feeling that I’ve had for awhile which has been reinforced by the rash of injuries. It’s a matter of personal taste whether you prefer a hot start or a hot finish. I tend to like the latter–no false hopes raised (except for next year’s). Others prefer the former–believing a hot finish is just a way of saying you can only win when the pressure’s off. Interesting stuff about Matsui. Yes, baseball is a funny game. I hope they don’t start off 6-and-20 bad, but I’d be happier if they start off poorly and improve later. I’ve had enough of false hope. All I ask is to have a chance to see something fun when I go to a game.